Aloo Bhujia Sandwich! It reminds me of my childhood. A friend used to bring it in her lunchbox and that was the first time I was introduced to this easy but yummy dish. Even a kid can make it. I even used to have it during my hostel life. I’m using this Sandwich Maker. Click to buy it. Last month, when I was waiting for my things – the packers and movers delayed in delivering my stuff – I had to depend entirely on outside food as I didn’t had anything to cook, no vessel, no gas stove and no microwave. And I was tired of having bread and butter daily in breakfast. I tried making this sandwich and ahh! it was a savior! I recommend this sandwich for all. Even if you are running late for office, just three minutes and you can have breakfast. Something is better than nothing. Right? Plus you cannot and should not skip your breakfasts. 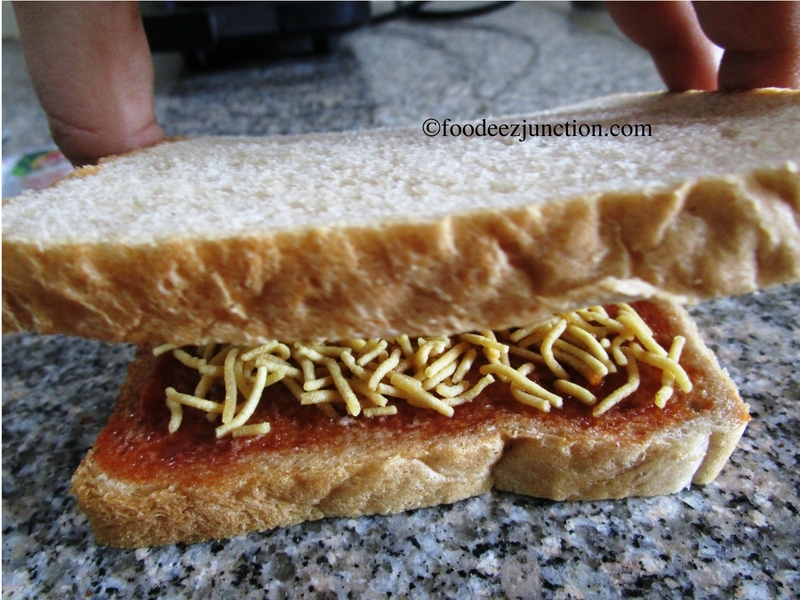 This Aloo Bhujia Sandwich includes aloo bhujia, bread, salted butter and tomato ketchup. Apply very less amount of butter on both the sides of breads. Take one bread, on one side put 2-3 tsp tomato ketchup and spread it evenly on the bread. Now add 4 tsp aloo bhujia. Do not over-stuff it. Put another slice of bread over it and put it in your sandwich maker. Repeat the same process for the other 2 bread slices. That’s it! Our Aloo Bhujia Sandwiches are ready! Here is another method for this Sandwich. 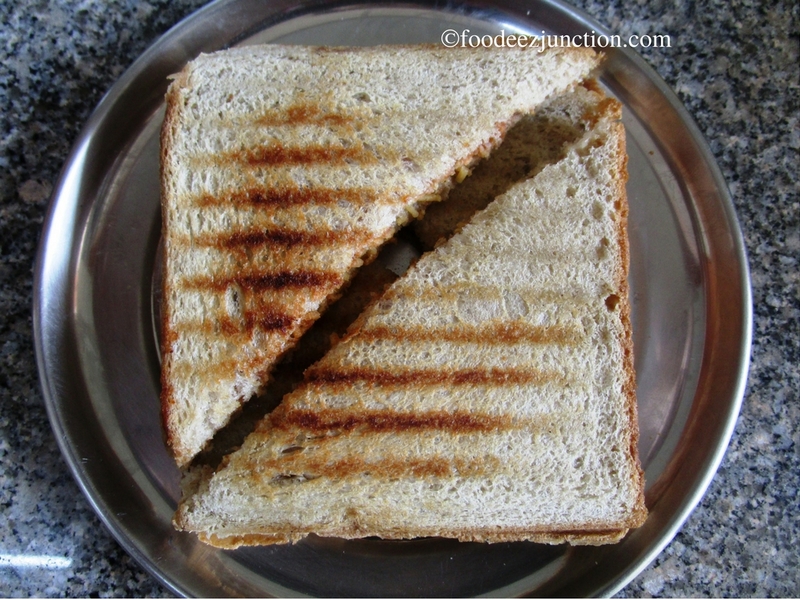 If you are a kid or you are staying at hostel with limited amenities, this recipe is perfect for you. Apply butter on only one side of the bread slices. Take one bread slice, put 2-3 tsp tomato ketchup on the side where you had applied butter. Spread evenly. Now add 4 tsp aloo bhujia. Place another bread slice over it. Repeat for the rest of the bread slices. 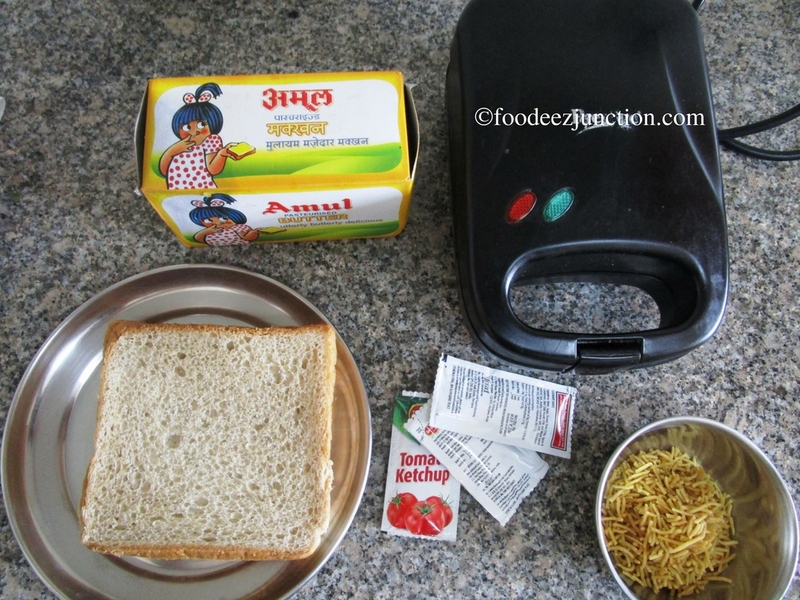 Your no-cook aloo bhujia sandwich is ready! Easy. Isn’t it? This looks fun to try with little ones! Sure! Let me know too how did they like 🙂 keep spreading your love about Foodeez Junction and don’t forget to follow my blog on FB.